A workgroup is being set up by deputies of Russia's parliament to calculate the damage that Nazi Germany inflicted upon the Soviet Union during the Second World War. Initial estimates place the figure between $3.43 to $4.56 trillion dollars — but good luck getting Germany to pay. As Izvestia is reporting, this idea was proposed by Mikhail Degtyaryov, a member of the supreme council of the Liberal Democratic Party of Russia (LDPR). His contention is that Germany has hardly paid any reparations for the destruction and atrocities inflicted on the Soviet Union during WWII. 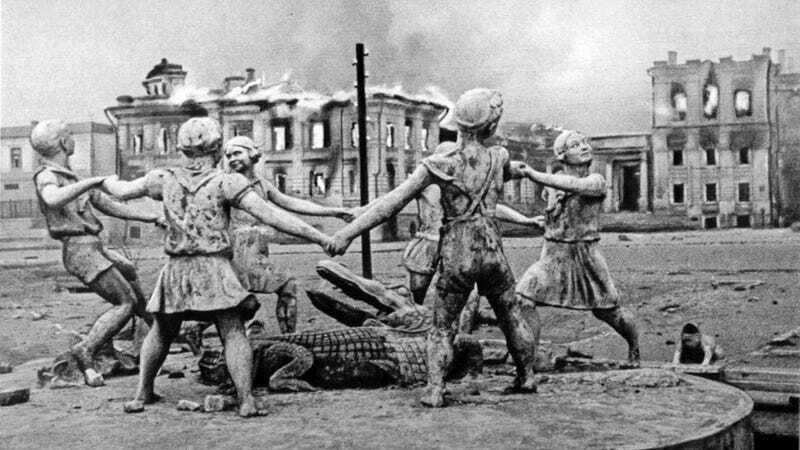 Degtyaryov referred to the Soviet government commission that assessed WWII damages as 30% of the national wealth, adding that the Nazis destroyed 1,710 Soviet cities and towns, 70,000 villages, 32,000 factories, and 100,000 collective farms during the ill-fated Operation Barbarossa. "What we have now is that Germany repaid compensations over 6 million victims of the Holocaust but ignored the deaths of 27 million Soviet people, over 16 million of which were civilians," he added. Degtyaryov contends that, under the Yalta agreements, the USSR recouped some damage by taking away a number of German assets in the form of "furniture, clothing, [and] industrial equipment," and that this insufficiently compensated for the damage incurred by the war economy of the USSR. And while an agreement to cease reparations was signed with the Soviet-propped German Democratic Republic, no similar agreement was ever forged with the Federal Republic of Germany (either before or after reunification). Revealingly, Degtyaryov admitted that the issue remains open and topical because Germany is supposedly inflicting damage on Russia as it presses forward with "unlawful sanctions" on behalf of the European Union. Should they go ahead with the lawsuit, Russian parliamentarians concede that the chances of winning are extremely low, but that it's important to remind the Russian people about history. [S]ome lawmakers were extremely critical of the motion. The deputy head of the upper house Committee for Foreign Relations, Vladimir Dzhabarov, said that all reparations issues between the USSR and Germany were settled in 1950s and returning to the issue could only bring problems. "All we can achieve through bringing up this question is the deterioration of our relations with Germany, which aren't that good at the moment. Russia has enough problems apart from these reparations," the Rossiiskaya Gazeta daily quoted the senator as saying. The chair of the State Duma Education Committee, MP Vyacheslav Nikonov (United Russia) called the LDPR initiative "utter rubbish" in press comments and noted that the stirring up old conflicts was a stupid thing to do at the moment. "Germany has paid the reparations, mostly it was done by East Germany. This problem has been solved. They stopped paying in 1953," Nikonov noted. Germany has already said that it isn't going to pay Russia a single dime. And as Tass reports, "repayment of reparations is possible only upon an interstate agreement and it is practically unrealistic to recover any reparations seventy years after the end of the war." Russia may or may not hand Germany this lawsuit, but it's clear that some of its more nationalistic elements are using this ploy for propaganda purposes, and as a way to use history to further inflame anti-Western sentiment. Russia also needs to tread carefully, here — lest it be slapped by countersuits from former Eastern Bloc countries, all of which could argue they suffered tremendous humanitarian and material losses under de facto Soviet occupation.